You may have seen me Instagram a Camo print sweatshirt from J Crew a few months ago. While it's not my typical style, something about the edgy casualness called to my sense of fashion. The fabric looked rich and the cut looked good. This was no cheap sports' store boxy sweatshirt. This was a stylish wardrobe piece. 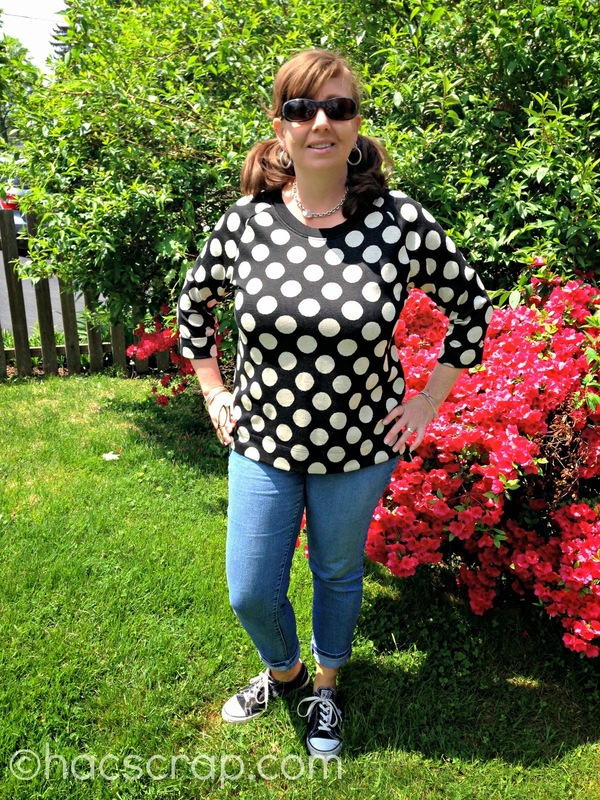 I didn't get the Camo Sweatshirt, but a few weeks ago, I did snag a pretty polka-dot number at Coldwater Creek. (Hurry - they are liquidating and closing all of their stores) I'm not sure if it was the cut or the pattern that called to me, but I tried it on with a pair of white straight leg jeans, and had to have it. Jewelry: Tiffany choker, Kate Spade Earrings and Alex and Ani Bracelets. So I'm planning to wear it with my white jeans still. I also think it would look cute in late summer/early fall, over a white shirt with a pair of black ankle pants. I try not to buy anything that I can't put at least two outfits together with. So far I'm at three with this sweatshirt, and it would also work over a black bathing suit for a beach cover-up. So are you a sweatshirt fan? Fashion yay or fashion nay?